Recent analyses made by the Opificio delle Pietre Dure in Florence on a number of works by Sandro Botticelli identify him as one of the main artists using the “tempera grassa” technique. 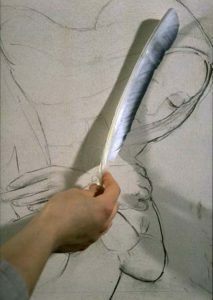 After an initial period of experimentation, Botticelli seems to have maintained the procedures of this technique unaltered in his activity. In many aspects, the methods used in the maestro’s workshop are the same as those given in the Il Libro dell’arte (The Craftsman’s Handbook) by Cennino Cennini. He used wood panel constructed out of poplar (works such as “The Birth of Venus” on canvas are still an exception). The ground preparation consists of two different coats of gesso and glue: the first being thick and porous, the second more compact – made of finer material and richer in binder. The chemical analyses have identified the precocious use of oil in these layers, giving the preparation a translucent effect. In addition, the oil made the ground less absorbent facilitating the application of the colours and glazes. 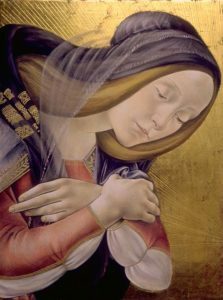 Already, in this initial phase, Botticelli’s technique is aimed at obtaining the greatest brightness and luminosity possible. The artist drew with charcoal on a perfectly smooth ground preparation. The charcoal – following tradition – was used to set the composition and to identify the forms. After being lightly dusted away, the drawing served to indicate the placement of the figures and as a guide for following the incising of the areas to be gilded. Before he traced over the lines with ink, and after the bole and gold leaf were applied, the painter laid in a coloured priming made of pigment, egg and oil. These materials not only reduced again the absorbency of the ground, but they also created a base colour that came into play in the final chromatic effect. With the intended final effect in mind, the artist used a black priming under the areas of vegetation, a light yellow priming under the green cloaks, orange under the red clothing, and white under the flesh tones and the rest of the clothing. The white priming allowed for luminous effects that were not possible with the dead colour of the translucent white ground preparation. In addition, at the end of the gilding process the translucent ground was meant to look partially “soiled” by bole and gold leaf. On the outline left by the charcoal, Botticelli went over the drawing with a brush and a diluted black colour (carbon ink). Three different types of lines have been identified: very thin, precise marks outlining the areas for flesh tones, thicker lines for the contours of the clothing, and finally, broad brushstrokes washing in the shaded areas. At times the latter can be found with the full chiaroscuro range, while in other cases they are only suggested and approximate. This difference in handling is due to the different chromatic effects that the artist knew he wanted in the final painting. For those areas that were to be finished with a thin, transparent impasto, the chiaroscuro underlying effects were used to their fullest. Instead, in those areas where colours with more hiding power were to be used, the wash was approximate. Finally, for the flesh tones of the women figures, the ground was left without any wash in order to achieve maximum brightness. Botticelli – who had in-depth knowledge of all the techniques of his time – was constantly pushed to achieve the maximum luminosity and colour saturation possible. He chose the brightest pigments; he did not use earth colours (except for ochre); he made great use of the lake colours and other pigments that had been artificially rendered transparent (copper resinate and natural ultramarine blue bound to quartz). Botticelli applied the paint in thin, uniform layers, using very finely ground pigments. The binding medium he used is an emulsion made with egg and oil, but in the final glazing he substitutes the egg with natural resins. The colours are pure, applied without ever mixing them, and the transparencies thus achieved create an infinite number of tonal variations while still maintaining the maximum level of saturation. For the drapery, Botticelli took full advantage of both the hiding power and the transparency of the various pigments: for example, the red garments are painted with glazes of rose madder over the very carefully drawn chiaroscuro. The Virgin’s blue robe is made with a layer of transparent natural ultramarine blue. The highlights are created from the white priming and the shadows are made with glazes of lake colours. We can see how the painter was able to obtain a wide gamma of tonalities while still using a very limited palette. Even though the garments and draperies are at times painted with thick impastos , they were nevertheless finished with transparent glazes. The thickness of the pictorial layer is fairly variable. For example, the areas of vegetation are well-bodied due in part to a pigment with rough granules. Differently, the flesh tones contain pigments that are very finely ground and their resulting layers are fairly thin. On top of the white priming the paint was applied with thin, successive brushstrokes of pure colour without waiting for the underlying layer of colour to completely dry. This pictorial method is technically extremely difficult, but is does allow for the perfect fusion of the layers while still maintaining the maximum luminosity. In terms of the faces, the drawing was washed in only for the male flesh tones, making it possible for the painter to achieve a greater expressiveness. For the flesh tones of the women and the youth, Botticelli did not use the chiaroscuro base but instead used the white ground preparation to achieve effects of maximum transparency – in his constant attention to light. Additional embellishments were then made with oil gilding or shell gold techniques. Both of these techniques were described by Cennino Cennini along with the more traditional method of water gilding. The former techniques are much used in this artist’s work notwithstanding the minimal attention given by some humanists to the various gilding methods. In reality, it is during this period that this art reaches one of its highest moments, in the search for a variety of effects that were unknown in the previous centuries. Estratto da: Artis (Art and Restoration Techniques Interactive Studio), Direzione scientifica: Manfredi Faldi, Claudio Paolini. Cd Rom realizzato da un gruppo di istituti di restauro europei, coordinati dall?Istituto per l?Arte e il Restauro Palazzo Spinelli, con il determinante contributo della Commissione Europea nell’ambito del programma d’azione INFO2000.